the horseshoe-shaped bone forming the lower jaw. adj., adj mandib´ular. 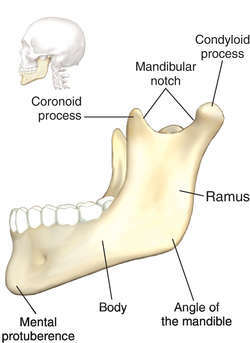 It consists of a central portion, which forms the chin and supports the lower teeth, and two perpendicular portions, or rami, which point upward from the back of the chin on either side and articulate with the temporal bones. A U-shaped bone (in superior view), forming the lower jaw, articulating by its upturned extremities with the temporal bone on either side. 1. The lower jaw of a vertebrate animal. 2. Either the upper or lower part of the beak in birds. 3. Any of various mouth organs of invertebrates used for seizing and biting food, especially either of a pair of such organs in insects and other arthropods. a large U-shaped bone constituting the lower jaw. It contains the lower teeth and consists of a horizontal part, a body, and two perpendicular rami that join the body at almost right angles. 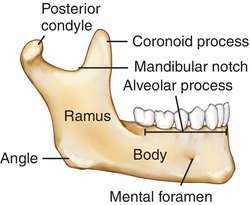 The body of the mandible is curved, somewhat resembling a horseshoe, and has two surfaces and two borders. The superior border of the mandible contains sockets for the 16 lower teeth. The inferior border provides a groove for the facial artery. Compare maxilla. mandibular, adj. The lower jaw bone. The joint where the mandible meets the upper jaw at the temporal bone is called the temporomandibular joint. A U-shaped bone, forming the lower jaw, articulating by its upturned extremities with the temporal bone on either side. Synonym(s): jaw bone, mandibula, submaxilla. The horseshoe-shaped bone forming the lower jaw. The lower jaw bone. The head of the mandible, on either side, articulates with a hollow on the underside of the temporal bone, just in front of the ear. This is called the temporo-mandibular joint. The mandible is pulled upwards by powerful masticatory muscles. In dislocation of the mandible, the heads slip forward out of the hollows in the temporal bone and the mouth remains wide open until the dislocation is reduced by downward pressure on the back teeth. that part of the mouthparts of an animal which does most of the crushing of food materials. In vertebrates, the term usually denotes the lower jaw. In insects and other arthropods, the mandibles are one of a pair of mouthparts used for crushing food (see Fig. 197 ). The medical term for the lower jaw. One type of oral appliance used to treat OSA pushes the mandible forward in order to ease breathing during sleep. U-shaped bone (in superior view), forming lower jaw, articulating by its upturned extremities with temporal bone on either side. Synonym(s): jaw bone, lower jaw, mandibulum, submaxilla. n the border of the lower edge of the mandible. Begins anterior to the insertion of the masseter muscle at the inferior surface of the angles of the mandible and is continuous anteriorly with the incisor region. n the physiologic rest position, or the rest vertical relation of the mandible. Consists of a central body, which forms the chin and supports the lower teeth, and two vertical or perpendicular rami, which point upward from the back of the chin on either side and articulate with the temporal bones by their condylar processes. The rami end as coronoid processes. In ruminants and carnivores the mandible is permanently divided into two halves by the mandibular symphysis, a joint that allows some rotation. generally enlarged due to osteodystrophia in horses and pigs; localized enlargement in actinomycosis of jaw in cattle, bone neoplasm.